MDG 2 stands for Millennium Development Goal nr. 2. 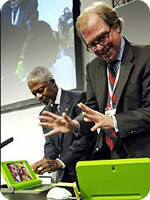 OLPC, is an Open Community Project, aligning with MDG 2 of course. Millennium Develoment Goal Nr.2 is of course much larger in ambition and scope than OLPC's mission. Last edited on 16:14, 24 July 2013. >600 views of this page. One Laptop per Child and the OLPC logos are trademarks of OLPC.